While we often make a non-standard Thanksgiving meal, this year we did it pretty much straight-up traditional. The leftovers, on the other hand, we've been playing around with a bit. 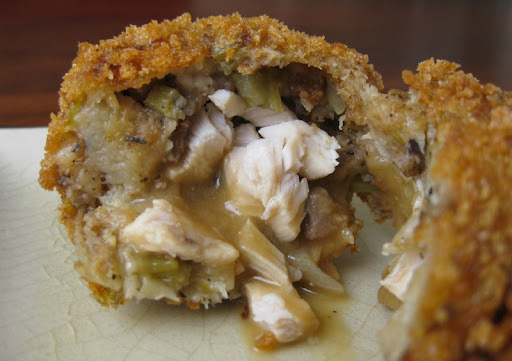 Case in point, these stuffing croquettes. 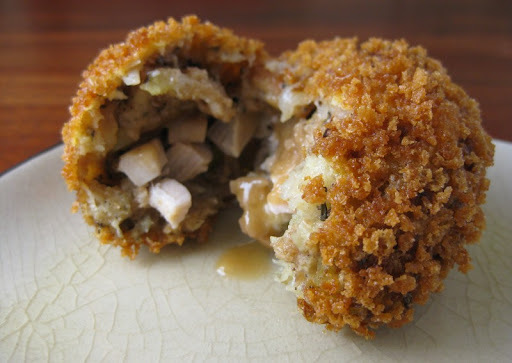 Think of them as Thanksgiving in a ball. 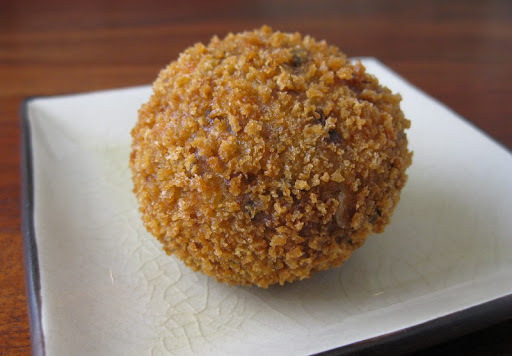 A crispy, fried ball. 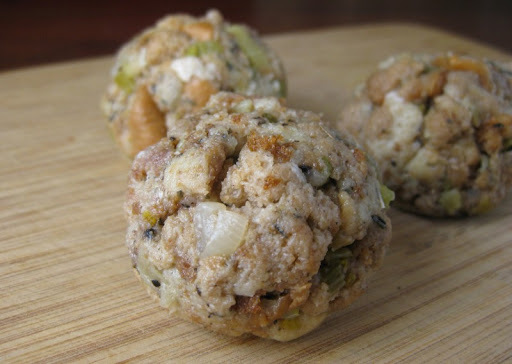 We took some leftover stuffing, mixed in some small bits of turkey and formed them into balls. 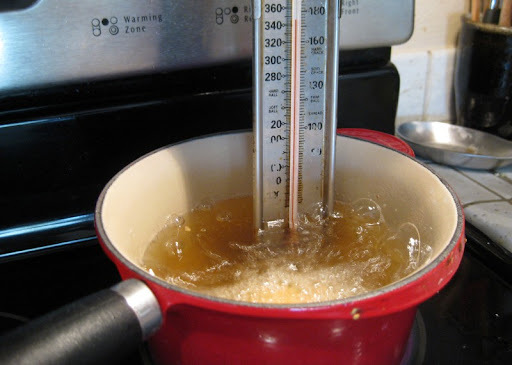 The gravy center was added to each ball by poking a hole, inserting a gravy "cube" (the gravy was set up well enough at fridge temperatures to be easy to work with) and then re-forming the ball. And fried in oil at a temperature of about 350°F until they were golden brown. We initially tried a higher temperature, but the outside cooked before the gravy in the middle had time to melt. Although it was difficult to restrain ourselves from eating them straight out of the fryer, we found that it helped to let them rest for a few minutes to let the heat penetrate through. I think we've definitely got a fun new addition to our Thanksgiving leftover repertoire. What a clever and wonderful way to eat leftover! I love it! wow, very nice and creative! btw, where did you buy your thermometer? What a great idea for leftovers! Did you use egg to make the breading stick? Yes, we did a standard coating technique: 1-roll in flour, 2-dip in beaten egg, 3-coat with Panko. You could probably omit the flour, but egg definitely helps the crumbs stick more evenly. Wonder if it would work with the more dry cornbread stuffing? 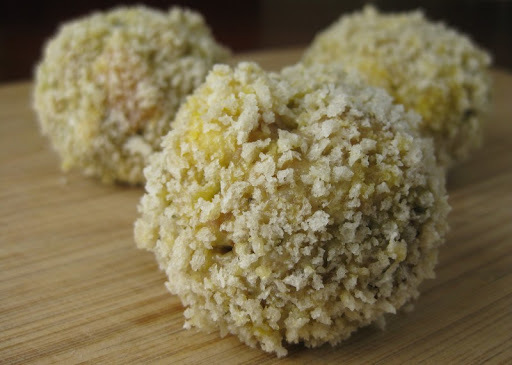 I'm sure the flavor would be good with a cornbread stuffing, but you'd need to add enough liquid or an egg to make the stuffing hold together in a ball shape while frying. I made it tonight and it was fabulous. No egg necessary it held together just fine. I thought that the dressing I used might not be moist enough as it was leftover dressing that was not inside the turkey but on the side. Although I had to work with it a little it held together. Wonderfully easy and scrumptious! Will make this a leftover tradition! Cheryl - Thanks for letting us know the fried croquettes held together successfully even with dressing cooked outside the bird. We were traveling this year so didn't get to make them - I'm jealous!